No matter how good you try, beginners mistakes are part of every learning proces. Nonetheless, in most cases it’s the spider suffering the human mistakes. Nobody is born excellent, but an informed man is worth 2. This page is written to be a helping tool throughout your start in the hobby by pointing out common beginners mistakes. To keep it readable, we kept this page short on purpose. Follow the links to learn more about a certain topic. When you enter the hobby, don’t purchase any spider blindly. It would be extremely unfortunate if it comes out you don’t like the spider’s behavior and/or you can’t provide environmental conditions as required.  Read the scientific papers on World Spider Catalog, become a member of British Tarantula Society, read books and keep an eye on this website. Besides the detailed caresheets, especially the webpages about the bird spider and its lifecycle, prey, terraria, anatomy, first aid in arachnids and top 10 bird spiders for beginners are interesting for starting hobbyists. Different bird spiders have different lifestyles and different needs. Depending the type of bird spider, a different terrarium is advised. Terrestrial bird spiders, for example, need more surface than height, which is in contrast with arboreal bird spiders. Spiders may lose a leg when stuck in the ventilation holes and especially terrestrial bird spiders may suffer dangerous falls if the terrarium is too high. Terraria for Ypyrabora, Avicularia and Caribena spp. need crossventilation. Lock the lids and in case you’re using plastic boxes, make sure the spider can’t escape through the ventilation holes you’ve made yourself. Avoid all sharp objects, cactusses included, and make sure the interior can’t collapse. At least one decent hide in which the spider can fully retreat is no unnecessary luxury. Provide a decent amount of substrate, even for the bird spiders living above the ground. In some cases young arboreal spiders tend to live close to the surface, or even underneath the surface. Terrestrial species on the other hand have been seen redecorating the entire terrarium and/or burrowing themselves. Never take away the opportunity of burrowing. The use of removable substrate is necessary. A cage filled with wooden chips and/or a thick layer of cocos fiber (as shown on the picture) over the substrate can’t be excused. On a sidenote, limited use of cocos can be useful to maintain humidity for a longer period of time in different places in the terrarium. Novice keepers often carry preferences towards rare species, potentially dangerous and giant species. Even expensive species are often high on the wishlist. That’s ok, after all everyone is intruiged by certain species. However, the motivation of keeping one is often exceeding personal limitations. Make sure you’re ready for a spider in particular before you buy one. Think twice and listen to your gut feelings, in stead of getting the spider because of the thrill and the reputation of owning one. Same rule goes for fast growing collections. Quite a few myths are going around in the hobby. Only with proper education and profound self study we can fight these myths in favour of our beloved pets. Keeping spiders includes a certain study in order to understand and respect a bird spider’s way of life. Spiders are perfect examples of sublime adaptation. That’s why they sometimes live months in horrible conditions without the owner noticing. Spiders, however, tend to leave their habitat if conditions are not optimal for a longer period of time. By locking them up in cages, the least we can do is provide a comfortable environment as close as possible to her natural environment. As some of our spiders often fall victim of generalisation, good information is crucial. A typical spider in this category is Brachypelma albopilosum, which spider is the only one in the genus requiering a rather humid environment. 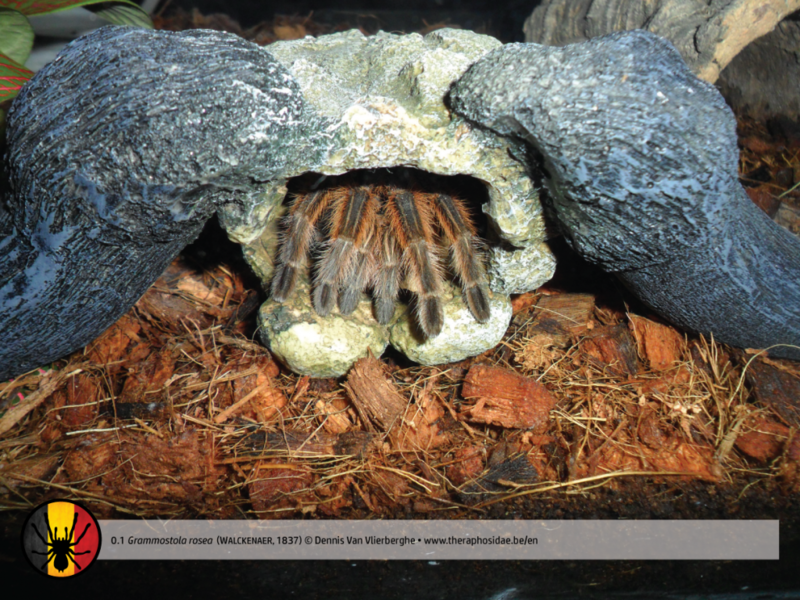 Caribena versicolor dies fast, and especially at younger ages, if not given good crossventilation and damp environment (more info in the link). Even temperatures often tend to be too high in our enclosures, as people don’t consider a thick layer of tree tops blocking the sun and/or a spider’s preference for the northern slopes in hot area. A typical spider in this category is Theraphosa stirmi. Beginners’ cages often contain sponges and/or water gels. Spiders drink water, for which reason none of both “easy ways” work. Spray sufficiently and/or provide a water bowl with fresh water. Sponges attract bacteria. Besides a few exceptions, spiders live solitary. They’re small tanks, solely built to survive in the wild. The aimless disruption of a bird spider is only to please yourself, by which you’re not showing any respect for the animal’s way of life. Only redecorate and/or rehouse the spider if necessary, accept the fact spiders redecorate their terraria every now and then and do not tap the windows for reaction. Do not handle your bird spiders. Way too often you hear beginning hobbyists ask for spiders that ‘can be handled’. Recapitulating the fact spiders are on a survival mission, living solitary and far from all light, this is the wrong attitude to enter the hobby with. People stating spiders like to be handled, have not done proper research. Personification of irrational animals is a human characteristic. Nonetheless, there are a few experienced hobbyists handling their spiders. They do so with knowledge, experience and a bigger goal (like education and/or investigation), which stands in contrast with beginners looking for sensation. In all cases of beginners handling spiders, there is a potentially big risk for both human and spider. Spiders molt. In most cases they do so on their back, but that doesn’t need to be the case. Sometimes, and mainly African species, molt ventrally. The spiders are at their most vulnerable during molt and may suffer serious consequenses if not given the calmth they need. Way too often beginners make the mistake of spraying a molting spider. The thought of hydrating the spider to come through the molt is beautiful, but it doesn’t have any effect on inner hydration. That’s why this intervention causes more bad than good. A general guideline is that prey as big as the spider’s abdomen is optimal. Some spiders do not have any problem overtaking bigger prey. 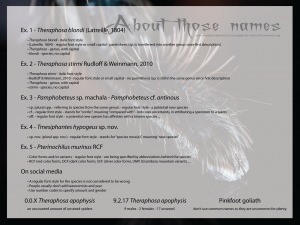 It’s no rarity beginning hobbyists with bigger species, like Theraphosa spp. or Acanthoscurria spp., feed rodents, like mice. However this doesn’t necessarily need to be considered wrong, this act is mainly about sensation in stead of “feeding” the animal. By sharing videos of rodents being killed by our spiders, just to aim for a shock effect, we’re on the basis of our own bad reputation. Attention. This may seem innocent, but the possibilities of wild prey carrying parasites are higher. I myself feed spiderlings once every 2 weeks and bigger species once every 3 weeks in during colder periods, with constant access to fresh water. When it gets warmer, I halve the interval. Beginners sometimes feed 2 or 3 times a week. Fast growing spiders need to molt sooner, which may reduce their lifespan. Spiders need to harden up before they can catch prey with reduced chances of injuries. Post molt the chelicerae are red and vulnerable for a few days. Wait a week before feeding spiderlings. Wait 2 weeks before feeding bigger species. Make sure the spider has access to fresh water. Remove surviving prey after 24 hours from the cage. Spiders reject food for a variety of reasons. One of those reasons is an upcoming molt. The continuous presence of prey nearby, may stress the spider and cause bad molt, or death. It’s one of the most commonly accepted myths that ICU (Intensive Care Unit) is the perfect treatment for dehydrated spiders. Doing so, you might kill your spider. Read more about this in our page about “first aid in arachnids“. The first months after your first buy already passed. As we all know the hobby is rather addictive, you probably got yourself a few more spiders. Driven by enthusiasm, you have been reading a few books, you joined a few groups on facebook and you find yourself staring at your pets daily. When someone asks for an id, you remember yourself the resembling spider you bought 2 days ago. Taxonomists have quite a job dividing one species from the other. They, however, use a variety of scientific methods to do so. Stating the spider is a species in particular, without scientific evidence, because she “looks like mine” or “like that one photo on google” is a decent contribution to misinterpretations and crossbreeding. If you notice people answering Brachypelma vagans on a request to id a species, they’re just mocking with this typical beginners mistake. No worries, every beginner will be able to separate the most common spiders by sight in time. This might sound weird, but the impact of people sticking to common names is bigger than you might expect. A lot of people won’t understand common names, for which reason the users are actively contributing to misconceptions. The study of scientific names comes with the purchase of your first spider. 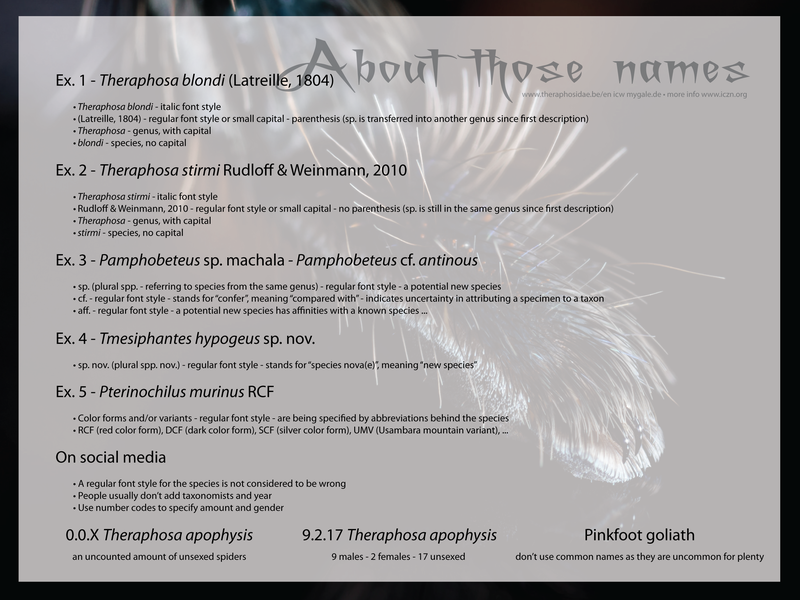 Read more about scientific names. Special thanks goes out to all active members of our facebookgroup to help create the list above.